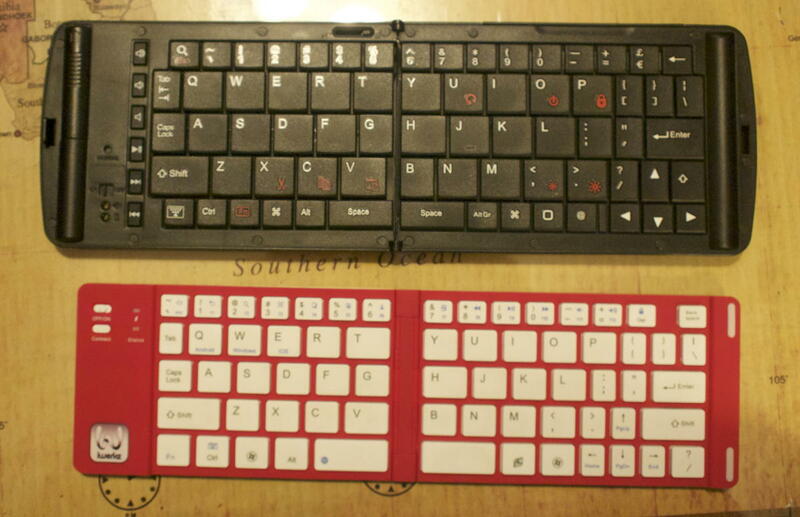 The Verbatim folding keyboard provides a fairly standard keyboard, at near-standard sizes. The main problem is that half-width SHIFT key on the right. While it seems to have been sadly discontinued, the three-in-one solar-powered Logitech K760 that I reviewed in A Tale of Two Keyboards is still going strong. The iWerkz has, sadly, developed problems. Some of the keys don’t work unless I play at the keyboard every time I turn it on, and some of the keys never do start working during some sessions. I’m pretty sure that the problems were battery-related. I’ve gotten so used to the durability of built-in batteries on Apple products that I forget, sometimes, why people like to be able to change batteries out. Because they lose power over time. The iWerkz customer support people were very responsive, but, as a writer, I need to have a keyboard that works not one that I can get working if I try hard enough. So when I went looking for a replacement, I specifically looked for a keyboard with replaceable batteries. That’s a tall order, because portable keyboards also need to be small. 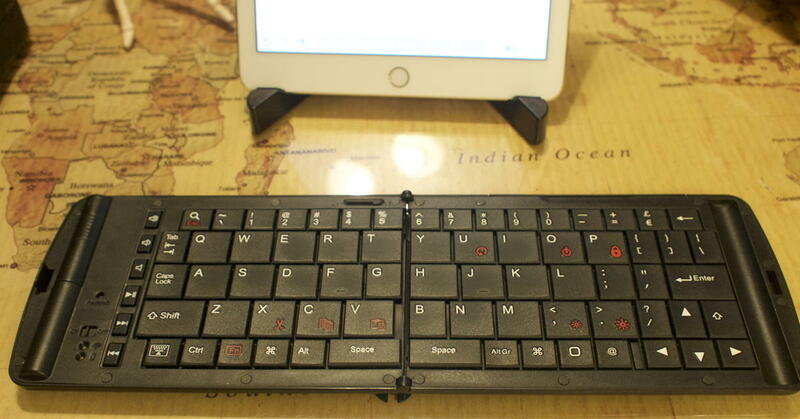 This Verbatim folding Bluetooth keyboard solves the problem by putting the two AA batteries into a ridge on the left, that folds over into a groove on the right. The Verbatim does not come with a handy iPad/iPhone stand. It does have a slide-out stand for iPhones, but it’s designed for older iPhones with the wider pin connector: the slide-out has a dummy piece of plastic sized to fit into the wide pin connector and hold the iPhone up that way. It won’t work with newer iPhones, and it won’t work with iPads, newer or older. While the older iPads also have that connector, the slide-out stand won’t support the greater weight of the iPad. Rather than a plastic case that doubles as an iPad/iPhone stand, as the iWerkz ingeniously has, the Verbatim comes with a leather-like pouch to protect the folded keyboard from battering while traveling. The Verbatim keyboard’s more standard key sizes is nice; but it does mean it’s slightly larger than the iWerkz. The lack of a stand doesn’t bother me, because I already have an articulated stand that I occasionally used when using the Logitech with the iPad. The Verbatim has one very nice feature that the iWerkz lacks: a sliding pin that keeps the keyboard from folding back up when placing it on a lap; the sliding pin also helps provide stability when using the keyboard on a soft surface. I doubt that the pin, being thin, will hold up to much pressure, but it’s still very useful. This is a feature that I missed almost every time I used the iWerkz, occasionally trying to envision some sort of sliding clip I could make that would hold the iWerkz steady without interfering with the top and bottom rows of keys. Folded, the Verbatim is also slightly larger than the iWerkz. 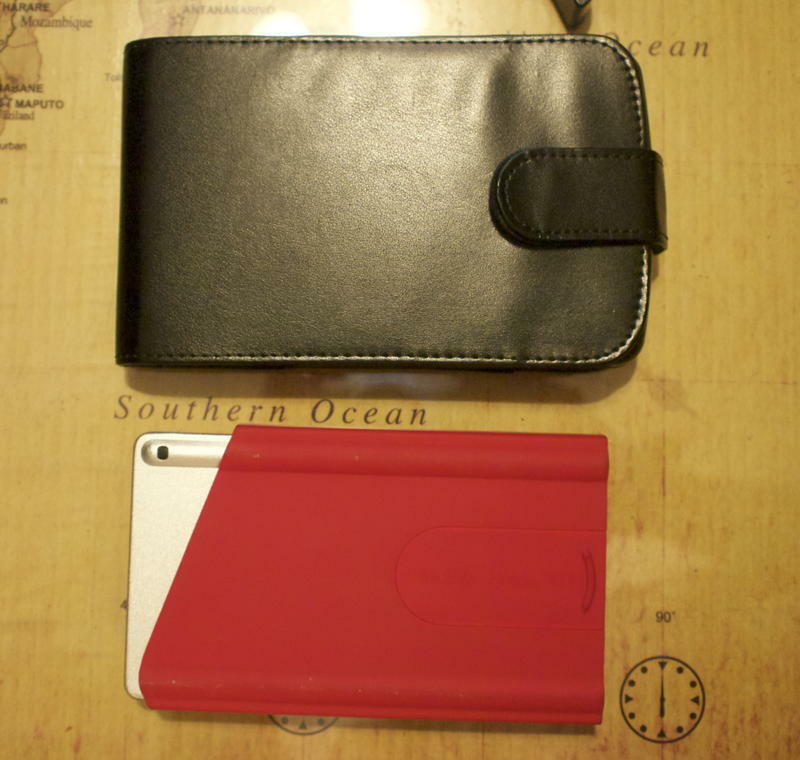 Its carry case is also not a dual-function case; it is solely for protecting the keyboard while traveling. The Verbatim is slightly larger than the iWerkz both folded and unfolded; as an added benefit, the Verbatim also has slightly larger keys than the iWerkz, and they’re more traditionally spaced. No more having to get used to the shifted location of the 6 through 0 keys; on the downside, the right SHIFT key is half-size, making it very easy to accidentally hit the “up” arrow instead. Worse, it makes it easy to hit both the up arrow and the SHIFT key at the same time, which selects from the current cursor location to the cursor location one line above, which will then be erased if you type whatever character you were SHIFTing. That latter is the only annoyance on this keyboard. I think I’d rather see the up and down arrows half-height, than the right SHIFT key half-width. Or, treat the up arrow as a SHIFT if the last key was pressed within, say, a half-second and it was a shiftable keypress. The batteries seem to last a long time. I haven’t changed the batteries more than once, and I bought it in July before going on a three-week trip. I also regularly use it with my iPad in the study—usually doing book reviews on Goodreads–—when I’m too lazy to go upstairs to the computer. In response to A tale of two keyboards: iwerkz and Logitech K760: Several months ago I replaced an aging Apple wireless keyboard with a Logitech K760 solar keyboard and an iwerkz portable folding keyboard. Both of these bluetooth keyboards do great in their intended purpose. This folding tablet stand is very sturdy; the legs fold out wide, and the top folds as necessary to provide a useful angle for the iPad or other tablet. On my Goodreads account, you can see how erudite and well-read I am. This is a very nice portable Bluetooth keyboard that requires two AA batteries. This means that when the batteries lose power, you can easily replace them and continue using the keyboard. Verbatim Bluetooth Folding Keyboard last modified September 27th, 2016.